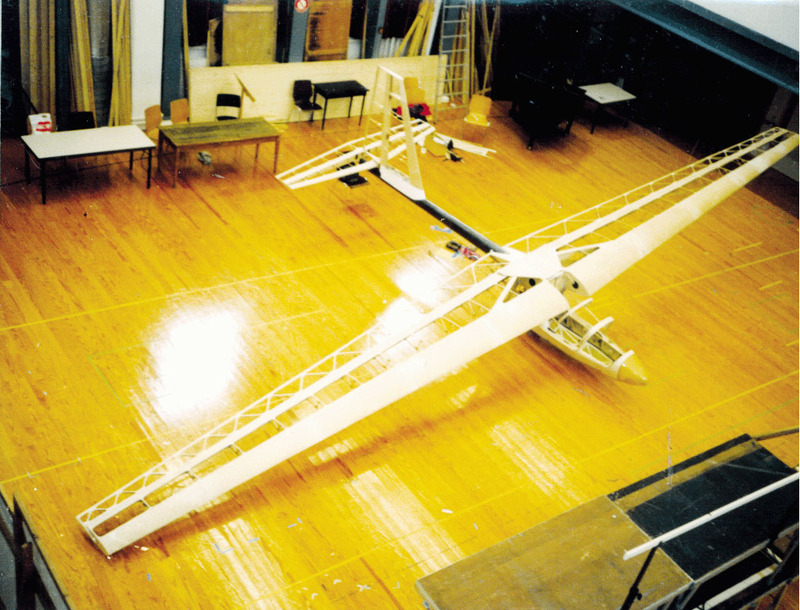 Kitplanes, January 2000, reports that 35 Carbon Dragon sailplanes are built. Below are listed 9 flying and 18 building. Don Santee in "The History of the Sailplane Homebuilders Association" reports 110 sets of drawings sold, 3 built and 2 flying. I am the holder of drawings set #248. 1/2005: Waiting on the Uk weather for the first test flight. Final finished weight 159 pounds. 9/28/2003: Wing load tested the Dragon yesterday,Saturday. It passed at 3g 465 kilos approximately 1000lbs.The wings weighs 27 lbs each. Fuselage, seat and harness 50 lbs. One Flapperon weighs 9.5 lbs. Rudder, tailplane and elevator weighs 9 lbs. 2000 2005 soon U.K.
Now flying! See 5 great photos at: http://www.sailplanehomebuilders.com/cd_indermuehle.htm. Smallman Plans holder #6. Kitplanes reports that Smallman used West Systems Epoxy. Bill Moyes is providing aerotows with the TUG for aerotow. Clyde Farquar With Betts above in SHA 12/97 ... two CDs in one photo! Note: Two flying CDs in one photo! gorgeous LightHawk wing. Stephane Abbett also responded by email. I don't know what to do about that yet . just try to find one . I will start building and cutting parts while I search for a copy of the builders manual . If you would like to add me as a builder please do . A very improved, modern Carbon Dragon-like glider being produced in Chili. Its name is MANQUE which means Condor in mapuchean. Note: for nearly 50 years, gliders have been built in Chile. See website, Aerodynamic Analysis of the Carbon Dragon Airfoils. Also, producing carbon seat pan for sale. 8.- curing time of 24 hours at elevated room temperature of 25 - 27 °C. - Progress is slow for a variety of reasons including a new baby and moving. At the moment I am carving out a working space for my CD and will continue with the production of the wing and flaperon ribs. The empennage is finished. Because I am heavier than Maupin, I have chosen a slightly stronger carbon on advice of AMOCO, where I bought the carbon (Thornel T350/35, 12K, 309NT) and will build the wing in a way that the leading edge is in one line, that moves the pressure point forward just enough to compensate for my heavier weight.